Ready to get strong and slim? discover health and fitness tips that will help you live a life of wellness and good health. 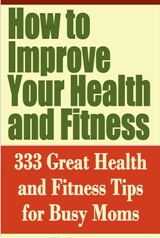 This book features dozens of great ideas and tips to help you learn quick and easy ways to maintain your health and be in good shape. Freeze a carton of yogurt overnight and take it to work with you. The yogurt will be thawed but still cold by lunchtime the next day; it's a delicious, low-calorie lunch. into lunch bags, with a different piece of fruit and cheese for each day of the week. Store the bags in the refrigerator and take one out each morning on your way to work. You can make and freeze sandwiches up to 2 weeks ahead of time, provided you use no jelly, mayonnaise, eggs, lettuce, or tomato in the filling. Butter the bread, add the sandwich filling, and wrap the sandwiches tightly in plastic wrap before storing in the freezer. A sandwich removed from the freezer in the morning will be ready to eat by lunchtime. If your work place offers nowhere to keep your lunch refrigerated during hot weather, freeze sandwiches containing mayonnaise or salad dressing the night before, even though mayonnaise separates when it's frozen. The sandwiches will thaw by lunchtime without spoiling from the heat. Plan well-balanced box lunches. Include a protein-rich food, a crisp fruit or vegetable, a beverage or soup, and a treat. Make extra servings of chili and stews to use in your lunch box. Pour them hot into vacuum containers for eating the next day, or freeze in serving-size portions for later in the week. Freeze cartons of prepared shrimp or crab cocktail. They'll thaw out but still be cold by the time you're ready to eat lunch. Good fillings for pita bread are grated cheese, cottage cheese mixed with tomatoes, onions, and cucumbers, a spread made from chickpeas, or pate. Add plain yogurt and shredded lettuce just before eating. To prevent soggy sandwiches, moisture-proof your sandwich bread by spreading on a thin layer of margarine or butter before adding the filling. For more food value-and to give you more energy-make lunch-time sandwiches from whole-grain breads and buns instead of white bread. You can cut down on calories at lunch (or at any other time) by eating hamburgers and sandwiches open-faced, with only one slice of bread or bun. A 40-ounce plastic freezer container provides the perfect lunch box for carrying salad fixings to the office. Add a low-calorie dressing of lemon juice and herbs just before eating your salad. If the salad is dressed ahead of time it will go limp. You can avoid that mid-afternoon slump that usually follows close on the heels of a heavy lunch by sticking to salads or light foods at lunch time. Try to use part of your lunch hour to visit a museum, do some shopping, or take a lunchtime exercise class-the break will refresh you more than a long, sedentary lunch. Fill plastic sandwich bags with an assortment of fresh vegetable sticks for a light vegetarian lunch, or for snacks to nibble if you're trying to avoid sugar-laden between-meal snacks. A packet of powdered skim milk provides a quick, vitamin-packed, liquid lunch food. It's also a real source of protein, calcium, and Vitamin B2. Keep a mouthwash concentrate in your purse or desk to mask the scent of any onions or garlic eaten at lunch. Better yet, keep toothbrush and toothpaste at work and make a habit of brushing your teeth after lunch. For an eat-on-the-run lunch) mix 1 fresh egg yolk into a glass of orange juice. Add a teaspoon of honey to sweeten. Even if you're in a hurry) don't gulp down your lunch. You'll only get indigestion later. Eat slowly) chewing your food well. Instead of taking a coffee and doughnut break) take an exercise break instead. Treat yourself to a handful of raw seeds or nuts afterward. Several ice cubes sealed with a twist tie in a plastic bag is an easy ice bag for keeping your lunch cold. Gaining or losing weight is basically a matter of addition or subtraction. Each pound on your body is worth 3500 calories. In order to lose 1 pound) you must cut back by 3500 calories. In order to gain 1 pound you must increase your food intake by 3500 calories. Despite extravagant claims by certain advertisers and certain health clubs) vibrating machines) body massages) saunas) and steam baths won't really reduce your weight. You'll lose a lot of body fluid because of perspiration) but the fluid will return as soon as you drink water. Don't expect to lose weight through exercise alone. Sensible dieting will help you lose weight) and exercise will help you maintain a firm) healthy body. If you're in the habit of eating while you're busy doing something else) such as watching TV or reading) make an effort to stop doing so. Making just a single change in your snacking habits can help you shed unwanted pounds. Instead of spending extra money on diet foods or low-calorie items, eat what you normally do but eat less of it. A glass of water can fill you up enough to distract you from hunger pangs and help you resist between-meal snacks. If you're having trouble losing weight) avoid having in the house 'instant' foods that can be eaten without extensive preparation. The thought of having to spend time preparing foods may deter you from eating them. Cutting down on alcohol can significantly reduce the amount of calories you take in. For some people it's possible to lose weight simply by eliminating alcohol from the diet altogether. If you're on a diet) it may help to turn after-meal cleanup over to somebody else. That way you won't be tempted to munch on leftovers as you're putting them away. Keep a record of everything you eat, and it'll be easier to reinforce your goals for weight loss. The record will also be a reminder of how often you are cheating on your diet. If you eat your meals with someone whose company you enjoy, you'll probably talk more and eat less. When you're tempted to have a second helping of some food, tell yourself you can have it in 5 minutes. During the 5 minutes, keep busy doing something else. You'll probably forget about wanting the extra food. Use smaller plates for your diet-size meals. Smaller portions look more satisfying on a proportionately smaller plate, and you won't feel that you're on starvation rations. The same strategy applies to wine glasses and dessert dishes. When you're on a diet, foods that take longer to eat can be more satisfying than easy-to-eat foods. For example, corn on the cob seems like more than the same amount of cut corn, and lobster in the shell will keep you busy longer than a boneless steak. When making stews and other dishes containing grease or fats, prepare them ahead and then store them in the refrigerator. The fat will rise to the surface, where you can easily lift it off before reheating and serving the dish. Substitute yogurt for whipped cream or artificial dessert toppings. Substitute club soda or mineral water for an evening cocktail. Eat fresh vegetables from a relish tray instead of fattening hors d'oeuvres. Dieters can snack, too, if their diet allows for it. There are many snacks that fall under 100 calories. Try 5 ounces of ginger ale over a peeled and sectioned orange. Or add a sprits of orange and lemon to tomato juice, then blend with ice cubes. Or prepare raw vegetables along with 1/3 cup of plain yogurt splashed with herbs for dipping. To cut down on calories, season your vegetables with lemon juice and herbs instead of butter. Dips made from packaged mixes pack a weighty wallop of calories, but it isn't the mix that makes them fattening-it's what they're mixed with. Most packaged mixes add only 50 calories, but the directions call for a base of sour cream (485 calories per cup) or cream cheese (850 calories in an 8-ounce package). You can cut calories dramatically by substituting plain, unsweetened yogurt -only 130 calories-for sour cream or the low calorie, low-fat "imitation" cream cheese-only 416 calories-for the real thing. If you check the nutrition information printed on competing packaged products and choose one with the lowest calorie count, you can save calories the same way a cost-conscious shopper saves money. The lower the fat content in dairy products, the fewer calories they contain. For example, cottage cheese that's labeled 99 percent fat-free has only 160 to 180 calories a cup, while regular creamed cottage cheese has 240 to 260 calories. The word "imitation" on low-calorie, low-sugar, or low-fat products doesn't necessarily mean that the product is made up of chemicals, only that the lower sugar or fat content keeps the product from conforming to standard recipes. Often the imitations are more nutritious than the real thing. For example, some low-sugar jams and preserves contain more fruit and less sugar, and some imitation low-fat cheeses have a higher protein content. If you drink 1 sugar-sweetened cola per day, you could lose nearly 15 pounds in 1 year by substituting a diet drink-or by eliminating the cola altogether. Lean Canadian bacon is a better choice for dieters than regular bacon, which is more than half fat even after it's been broiled or fried and well-drained. Canadian bacon contains only 45 calories an ounce compared with 200 for regular bacon. A cup of plain herbal tea (no cream or sugar) makes a no-calorie, no-caffeine, low-cost beverage. For a low-calorie lunch, roll your sandwich filling into lettuce leaves instead of using 2 slices of bread. A low-calorie substitute for sour cream: Mix cottage cheese in the blender until smooth and flavor it with herbs. If you're on a special diet and are taking a plane trip, call the airline 24 hours in advance to ask them if they can accommodate your dietary needs instead of serving you their regular menu. To avoid gorging yourself at holiday parties, drink a glass of skim milk or eat a piece of fruit before you go. This will take the edge off your appetite and help you resist the urge to devour everything in sight once you get to the party. If you don't want to be tempted by leftovers from your own party, offer guests the option of taking a doggie bag home.